The compact and robust design of the Kiber NTE progressive cavity pump makes it ideal for transferring whole or destemmed grapes. And due to its design it can be installed right under the destemmer. It also can be used for the process of devatting. 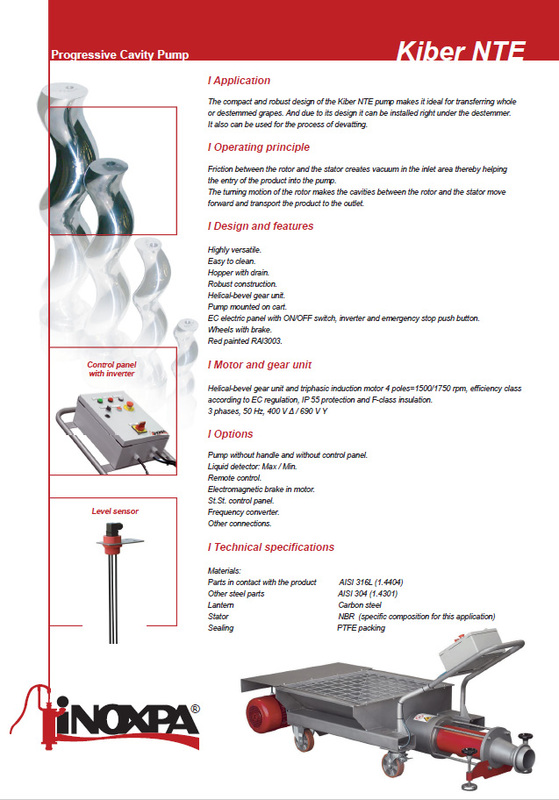 INOXPA is a progressive cavity pump supplier, offers Kiber NTE progressive cavity pump, ideal for pumping grapes. Friction between the rotor and the stator creates vacuum in the inlet area thereby helping the entry of the product into the pump. The turning motion of the rotor makes the cavities between the rotor and the stator move forward and transport the product to the outlet. EC electric panel with ON/OFF switch, inverter and emergency stop push button. Pump without handle and without control panel. Liquid detector: Max / Min. Summary La bomba Kiber NTE es de diseño compacto y robusto, indicada para el trasiego de vendimia entera o despalillada. 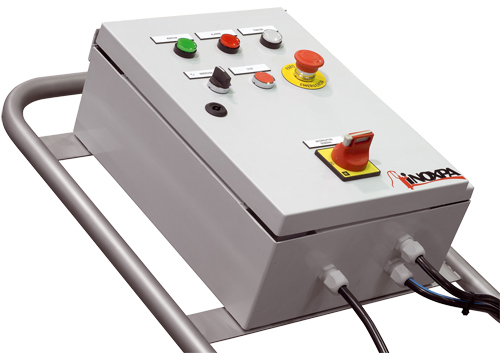 Summary The compact and robust design of the Kiber NTE pump makes it ideal for transferring whole or destemmed grapes. Summary La pompe Kiber NTE est de conception robuste, adaptée pour le transfert de vendange entière ou égrappée. Summary La pompa Kiber NTE ha una forma compatta e robusta, specifica per effettuare il trasferimento dell'uva intera o diraspata. Summary Винтовой насос Kiber NTE с компактной и прочной конструкцией предназначен для перекачивания цельного или очищенного винограда. Summary Este manual contiene información sobre la recepción, instalación, operación, montaje, desmontaje y mantenimiento para la bomba kiber NTE/NTEA. 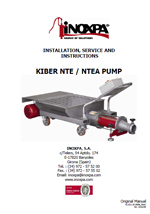 Summary This manual contains information about the receipt, installation, operation, assembly, disassembly and maintenance of the Kiber NTE/NTEA pump. Summary Ce manuel contient de l’information concernant la réception, l’installation, le fonctionnement, le montage, le dépose et l’entretien de la pompe Kiber NTE/ NTEA.